Spend a fun-filled day on the 23rd (Sun) at Prater. And it doesn't end there: take in nature's colorful creations at Schönbrunn Palace, pause for some photo ops at Volksgarten, appreciate the extensive heritage of Historic Center of Vienna, and see the interesting displays at Kunsthistorisches Museum. For other places to visit, traveler tips, maps, and more tourist information, use the Vienna itinerary maker. Rome, Italy to Vienna is an approximately 4.5-hour combination of train and flight. You can also drive; or take a train. Traveling from Rome in July, things will get slightly colder in Vienna: highs are around 31°C and lows about 18°C. Finish up your sightseeing early on the 25th (Tue) so you can travel to Nitra. Nitra is a city in western Slovakia, situated at the foot of Zobor Mountain in the valley of the river Nitra. Start off your visit on the 25th (Tue): savor the flavors at VÍNO MRVA & STANKO, a.s. and then make a trip to Synagogue - Center of Contemporary Art. 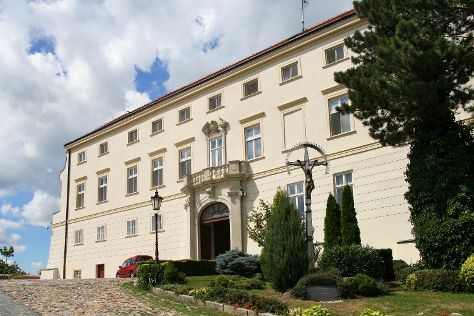 On the next day, pause for some photo ops at Corgon, pause for some photo ops at Prince Pribina Statue, then explore the historical opulence of Nitra Castle, then stroll through Park na Sihoti, and finally make a trip to Nitra Calvary. To see ratings, other places to visit, reviews, and more tourist information, use the Nitra holiday planner. You can drive from Vienna to Nitra in 2 hours. In July, daytime highs in Nitra are 32°C, while nighttime lows are 19°C. You will have some time to spend on the 27th (Thu) before leaving for home. VINO MRVA & STANKO, a.s.